Last night, my friend and I trekked over to Hollywood Forever Cemetery for Cinespia’s summer outdoor movie series. The film was the 1956 version of The Man Who Knew Too Much. The films are projected on a huge wall, which I’m guessing must be a mausoleum or memory wall of some sort. The large Fairbanks Lawn is right in front and makes a perfect area to set up for a night of movie watching. We set up a picnic blanket and brought food and beer along to enjoy before the screening started. 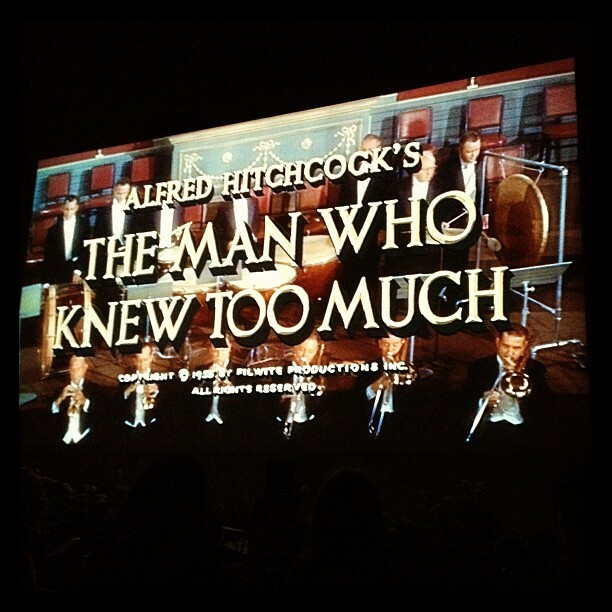 The Man Who Knew Too Much is a remake of a 1934 film of the same name, also directed by Alfred Hitchcock. It was Hitchcock’s third collaboration with Jimmy Stewart, following Rope (1948) and Rear Window (1954). The film opens with Dr. Benjamin McKenna (Stewart), his wife Jo (Doris Day), and son Hank (Christopher Olsen) on their way to Marrakesh for a vacation. Dr. McKenna meets Frenchman Louis Bernard on the bus, and Bernard invites the McKennas to join him for sightseeing while in the city. The McKennas find themselves being watched by another couple, the Draytons, but put aside their suspicions when the latter couple says they were starstruck by Jo, who was a famous singer. The two couples spend the next morning in the marketplace, where McKenna finds himself face to face with Bernard again, but this time the latter has a knife in his back. As he’s dying, Bernard tells McKenna of an assassination plot set to take place in London in the next few days. Shaken, the McKennas send Hank back to the hotel with Mrs. Drayton while they are questioned by the French authorities. While at the police station, the officer informs McKenna that Bernard was a French intelligence agent on assignment, and demands to know the information left with McKenna. During the questioning, McKenna is called out with a phone call, where an anonymous voice informs him that if he tells the police anything about the assassination plot, they will harm Hank. Alarmed that something isn’t right, McKenna sends Mr. Drayton back to the hotel to check up on Hank. When the McKennas return to their hotel, they find that Mrs. Drayton and Hank never made it back, and Mr. Drayton suddenly checked out. Realizing that their son has been kidnapped by someone in connection with the assassination plot, the McKennas head to London to try and link the connections to find their son. Armed with the vague details of the plot and the name of Ambrose Chappell, the McKennas navigate locating their son and foiling an assassination plot on their own without the help of the authorities. The film’s penultimate sequence at Albert Hall is fantastic. Bernard Herrmann conducts the London Symphony Orchestra while the assassin attempts to murder a foreign ambassador. The piece is beautiful, and creates an eerie tension between the heinous act of the hired gun and the gorgeous strains of music being played. It’s also neat to see Herrmann at work on film, as that collaboration between himself and Hitchcock is legendary on its own. Music plays a crucial part in the search for Hank as well. The hit song, “Que Sera, Sera,” sung by Doris Day, acts as a literal connector and identifier for the McKenna family, especially between mother and son. It’s also an insanely catchy tune; it ends up stuck in my head every time I watch this movie. While I enjoy The Man Who Knew To Much, it’s not in my top 5 Hitchcock films. There are parts of it where the suspense is thick, and there are some great, tense moments in the film, but as a whole it doesn’t feel as original or strong as some of the other Hitchcock classics. There are also some strange, dated moments, like when Dr. McKenna makes his wife take some sort of calming pill before he tells her that Hank is missing. The audience at the film last night really laughed at that one, as it brings back the ideas of the submissive 1950s housewife who had to take tranquilizers to quell her anxieties. The film itself looked great projected onto the wall, and the sound was good quality as well. For being an outdoor screening, most everyone was quietly enjoying the movie (although the guy next to me fell asleep and was snoring). It was also fun to see that the crowd was mostly younger, which is not something that happens at most of the classic film screenings I go to, and everyone was having a good time. I would definitely recommend an outdoor Cinespia screening. Get there early to grab a good spot on the lawn. We walked in right as the gates opened around 7:30 and were able to get a front spot, but it filled up quickly. It was also pretty chilly and the grass gets wet with dew as the sun goes down, so plan for that. I would definitely say I had a blast at my first outdoor movie screening! This entry was posted in 1950s, Directors, Drama and tagged 1950s, Alfred Hitchcock, Bernard Herrmann, Cinespia, Doris Day, Hollywood Forever, Jimmy Stewart, outdoor movie, The Man Who Knew Too Much. Bookmark the permalink. Wow, it sounds like a wonderful evening. And somehow, a cemetery seems like the perfect place for the screening of a Hitch film. This sounds utterly fantastic! Thanks for sharing your experience.